We are residing in connected commerce era where consumers are not entirely into online or in-store shopping category; rather they are taking blended approach i.e. choosing according to their needs. Adoption of intersecting point of physical and virtual world and leveraging technology to satisfy customers is success mantra in retailers and manufacturers. Online grocery shopping trend is driven in different parts on the basis of maturation of the digital native: Millennial and Generation Z. Although the overwhelming majority of grocery shopping currently takes place in brick and mortar/physical stores, this pattern will change in the upcoming years, as grocery e-commerce is poised to boom over the forecast period. Amazon’s disruptive approach to grocery includes a click-and-collect offering where customers can pick up online grocery orders within a 15-minute to 2-hour time window. In addition, the e-commerce giant offers Amazon Go’s checkout-free grocery shopping and Amazon Prime’s e-commerce membership platform, which includes private label groceries. 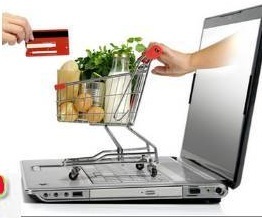 Digital enablement options like discount coupons, extended ranges of product, convenient payment gateways, door-step delivery, access to detailed product information, retailer loyalty program apps, products with a steady consumption rate and long shelf life are well suited to online purchasing, online automatic subscription and seasonal gifting are bolstering the global online grocery market. However, convenience is paramount in urgency, spoilage concern for perishable products and lack of inspection feature hinders the growth of online grocery market. According to Goldstein Research, global online grocery market is expected to grow at the considerable CAGR of 19.5% over the forecast period. In 2016, eCommerce retail sales account for 15% of all retails sales globally. This accumulates to a total of USD 2.24 trillion of revenue in 2016, up from USD 1.99 trillion in 2015. It is predicted that this growth will continue to increase with an estimated revenue value of USD 5 trillion by 2024 in global retail eCommerce market. On the basis of category, personal care product dominates the market owing to the competitive advantage on cross-selling, offers, and discounts, bundling prices and brand differentiation while online order for home delivery is the largest segment of eCommerce option. Geographically, the top market for grocery e-commerce is South Korea, where online sales account for 16% of the fast-moving consumer goods (FMCG) market followed by Japan (7.8%), the UK (7%), France (5.5%), Taiwan (5%), China (4.5%), Czech Republic (2%), Spain and the Netherland (1.5%) and US (1.4%). Consideration of channels holistically, as online and in-store are fundamentally different channels while laying down the plan/strategy, retailers need to consider the entire retail landscape and respect the differences between the two channels. In addition, before implementing multi-channel strategy know the target audience first by prioritizing initiatives and investments. Change in the wide industry needs to be recognized time to time by adapting marketing, merchandising, distribution, and operations models for the new retail landscape. By establishing credibility with the online hesitant customers during the interaction about their concerns in term of product quality and other specifics is one of the key strategies for eCommerce success along with experimentation with formats and features that boost basket size while adding value for customers can be extremely daunting. Tech-savvy consumers can easily detect whether an application or device adds value to their lives. Those that make their lives better will be kept, while those that do not will be discarded therefore adding value through digital medium. Attributes like prices, product quality, convenience, promotions, app management and efficient customer care services are store switching drivers. Time saving option has the strong appeal worldwide. For a detailed overview, send us request for market report sample.